High-Quality Restaurant Coasters Delivered To Your Door In Just 1-2 Weeks! Whether you're a restaurant looking for creative, branded restaurant coasters or a business looking to advertise at your local dining establishments, our restaurant coasters offer you theperfect advertising solution. You can customize our restaurant coasters with your logo, image or message and have them delivered right to your door in just 1-2 weeks. Our restaurant coasters can work for you. 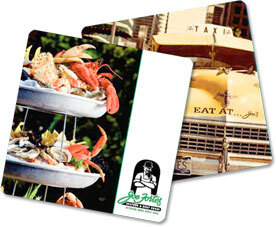 Restaurants can advertise daily specials on our high-quality European pulp board restaurant coasters. Restaurant coasters are the perfect way to advertise local events. Beverage companies can build brand awareness and increase sales by advertising with our high-quality restaurant coasters. Our bar coasters are a great way to advertise your menu items, drinks and special events like bands, live music.